Screencap from ABS-CBNNews.com. Watch the TV Patrol World report. 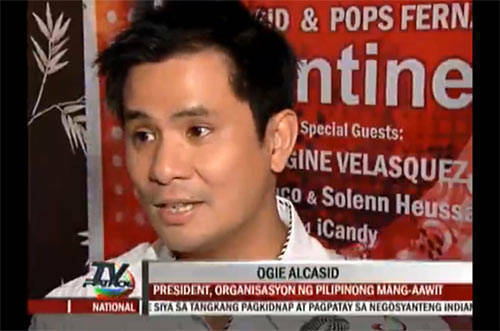 Singer-songwriter Ogie Alcasid is pushing for higher tax rates for international artists’ concerts in the Philippines, ABS-CBNNews.com reported on Friday. He also wants tax rates for local acts’ concerts to be reduced to zero. "Para ang laban ay patas (So that the competition would be fair)." Alcasid is the president of the Organisasyon ng Pilipinong Mang-aawit, which will convene this month to talk about the issue on tax rates in the upcoming general assembly, reports ABS-CBNNews.com. Last week, singer-actress Kuh Ledesma also called for the immediate regulation of concerts by foreign artists.